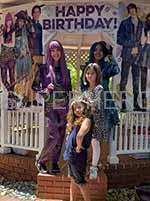 Hire A Princess – Bring Life To Your Daughters Birthday With a REAL SINGER! A birthday party is any child’s most waited day. The day when children want all their dreams fulfilled, the day when they want to be treated as special. Parents too, want to give the best to their children whether it is gift or anything else; they just want to make their kids happy. 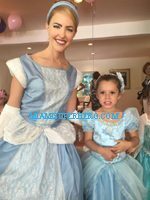 If you wish to plan a princess party in Miami, Pembroke Pines, Weston, Boca Raton or any area between Miami to Palm Beach to celebrate your child’s birthday so that it becomes a talking point for all the invitees, you need to think about what is the best experience like a LIVE SINGER performing versus a lip singer performing it does make a huge difference in the energy and impact of the show. Anyone can lip sing to songs and smile but we bring more than that with a real singing princess performance. Matter of fact, even parents at out events appreciate the talent of a singer and parents end up watching the show with more interest. Talent is what you get with us and it has proven time and time again to be a significant impact on this special day that every child waits for. Your children look up to you for exciting surprises, so think about talent over the cost. There are many cheap services around South Florida but trying to save a few dollars will lessen the overall feel and emotional gratification everyone will receive at the birthday. 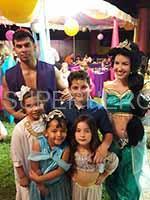 How about giving a the theme party by adding a prince or male role to the event like Kristoff of Frozen, Maui of Moana, prince Adam or the Beast, prince Eric for the little Mermaid, Florian for Snow White, Philip for sleeping beauty, prince charming for Cinderella, Sultan for Jasmine, Naveen for Tiana, Eugen Fitzherbert for Rapunzel or Tangled, John Smith or john Rolfe for Pocahontas, James for Sofia, Edward for Enchanted and more? 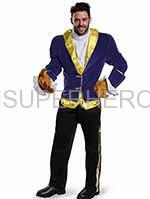 The performer arrives dressed like a fairy or princess, and this is when the whole surprise begins to unfold. The princess you choose will make a majestic entrance into the party! 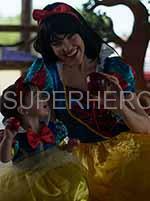 Have your cameras ready to captivate all the children’s reactions when they initially see their princess. Our princess will gather the children for an interactive role play story telling, engaging the kids in questions and talking about her amazing adventures in her land. Watch our talented singer, sing songs live on a cordless microphone or one of the lip singers serenade the birthday child and all the guests with songs from their world. Your child will learn how to walk, stand, talk and act like a princess. Also you can dress them up in princess costumes to get into the role. It is very cute to see the princess showing them how to walk the red carpet and speak into the microphone. Our princess will paint a pretty design with glitter. Many games are played with the children, 7 different games are included in the party. Your children will have a fantastic time playing with their favorite princess. We wrap up the party with singing happy birthday together with everyone, a farewell speech and giving a present possibly by you the parent or an autographed present from our princess. Then taking plenty of photos with all the family! Want to be your daughter’s knight n shining armor? 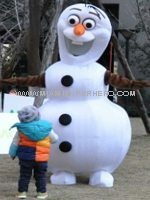 Then, give your child the most unforgettable memory that cannot be possible with toys and other types of birthday presents. Try to understand your child’s world. Tender minds are attached to the world of imagination where superheroes, fairies, princesses and other characters exist. When these characters come out from story books and television screens, it is a dream come true. 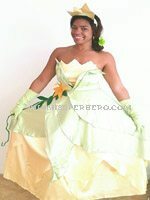 Imagine how all the kids would jump with joy when they would see their favorite party princess Miami, in front of them. 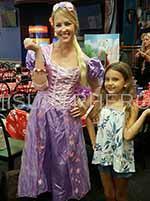 Your little girl can have her Rapunzel, Princess Sofia the First, Princess Belle or Cinderella celebrating and paying with her, on her birthday. Party princess Miami can make your Birthday girl’s day. Expect your child to have maximum fun with party princess Miami. 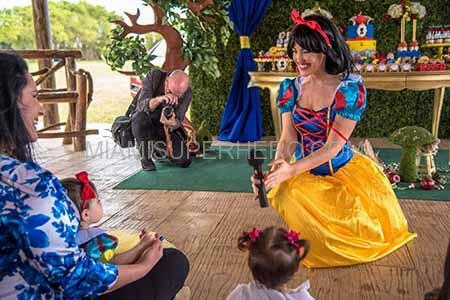 The princess participates with the children in all the activities. She takes a story book and reads a story to the children in the party takes part in their games and sings and dances with them. That special moment, when your child cuts the birthday cake, party princess Miami brings the cake to the birthday girl. She is there to help your child blow off the candles and cut the cake with all the family members. What’s more? 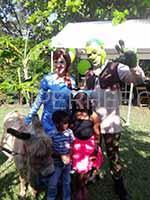 The princess would take pictures with all the children invited to the party and the family members. Your child will never forget the day when a princess came to celebrate his birthday. 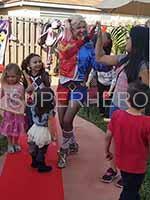 After all the activities, party princess Miami departs waving to all the children, good-bye. She departs in the style and manner of a princess. Every care is taken to make her appear exactly like one of the characters of the fairy tale. Her makeup, dress and even her hair, is made similar to the ones matching the princesses in the fairy tale books. 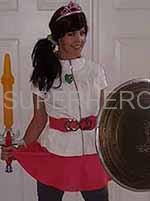 Give your little girl an unforgettable birthday, a party characters, a memory that she can cherish all her life. In the world of today, kids are becoming more and more involved with movie characters and cartoon characters than ever before. One thing that has never changed is that girls love the idea of becoming a princess. Becoming a princess is a dream that has stood the test of time and now you can give your special daughter the dream of becoming one herself with having a performer come out and teach the kids how to talk, walk and behave as a beautiful princess! 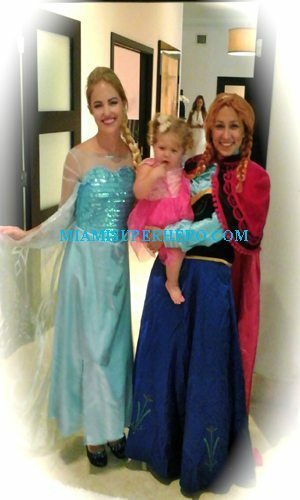 We are a Miami princess party company and we have been doing this for many, many years. 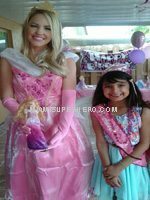 We offer many different packages that allow you to throw the best princess party your child has ever seen and will give them the day of a lifetime. There are many ways to throw a princess party but none do it quite the way we do. From the first person you talk to, until the last person leaves the party, we all look professional, look our parts, and convey our message without ever ridding your child of the illusion that her party princess fantasy is ending. Not only that, but we have different pricing options so that you are sure to find something that works for you and your little one(s). If you are simply looking for a character to stop by and involve your family in the program, we have a package for that. If you want the entire party princess pack that involves jewelry, characters, singing, book readings, cake, and many other arrangements, we have that option as well. The possibilities are endless and we have plenty of experience and expertise to be sure you are only given the highest quality and best feats for your child’s special day. 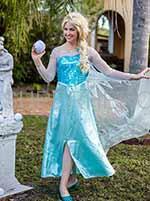 What also sets us apart from the type of princess party we throw is that we offer areas where everyone can create their own princess attire from scratch. Whether your daughter wants to see how a tiara is made, have a crown fitted for them, or even attach rhinestones to a dress to make it very beautiful, there are all sorts of creations we can do in a long span of time. Becoming a princess is more than just about the look and glamour but creating the attitude that the entire party is her ballroom. We will do just that and much more. 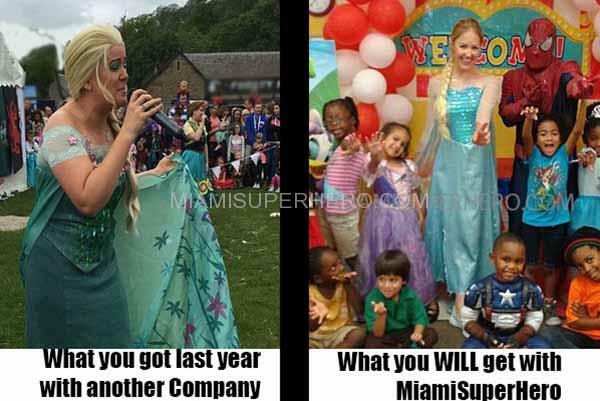 Give our Miami birthday princess packages a try and see what they can really do for you. 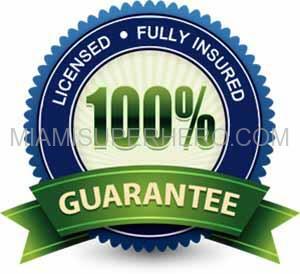 They are very memorable and will be something your family will talk about for years to come. The princess can do a 1 on 1 princess to child 15 minutes before the birthday party to wish her a happy birthday. This face time call is up to 5 minutes in length. The princess can bring princess jewelry to play dress up with all the children. 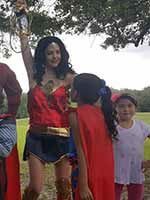 The children get to keep the jewelry and more importantly get to play dress-up with their favorite princess. Parents, dress up your little ones in unique attire. The princess can bring a nice red carpet, cordless microphone and host the birthday like a beauty pageant. She will train them and interview each one of them with cute questions and answers. A professional photographer will come to the party at the same time as princess to set up an area for professional photographs with lighting, back drops and camera equipment. Each additional 30 minutes is $50.